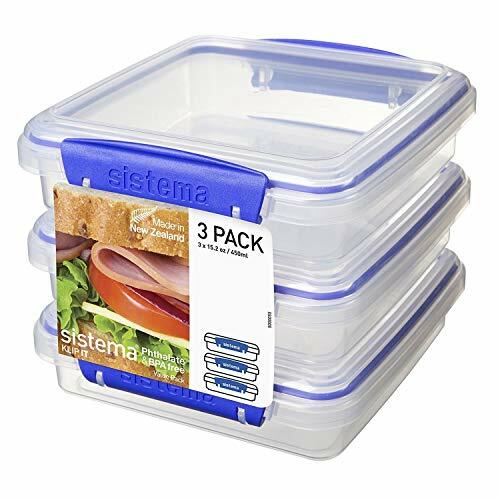 With a slim, rectangular design that is perfect for sandwiches, the Sistema KLIP IT Collection Sandwich Box makes a valuable addition to on-the-go lunches. This food storage container comes equipped with easy-locking clips and a flexible, tight seal to help keep your sandwich fresh until you’re ready for lunch. Crafted from BPA- and phthalate-free plastic, the container is dishwasher-safe when placed on the top rack, microwave-safe without the lid, and safe for storing in fridges and freezers. And thanks to its modular stacking design and compact footprint, this rectangular plastic container helps you save valuable kitchen space. If you have any questions about this product by Sistema, contact us by completing and submitting the form below. If you are looking for a specif part number, please include it with your message.